#1 This 3/4 sleeve grey cardigan is from Karen Millen, as shown, it looks just as good worn open as it does zipped up. It's quite a tight-fit cardigan so if you're looking for something more loose and drape-y, a waterfall cardigan might be better for you. This cardi available to buy now for £110 fro the Karen Millen online store. 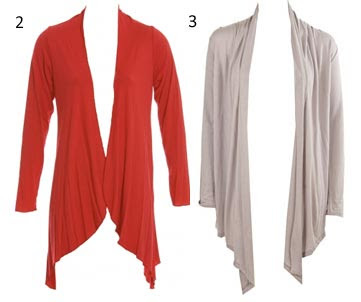 #4 & #5 are from a few more long waterfall cardigans from a selection at Marks and Spencer and are available in a range of different colours.